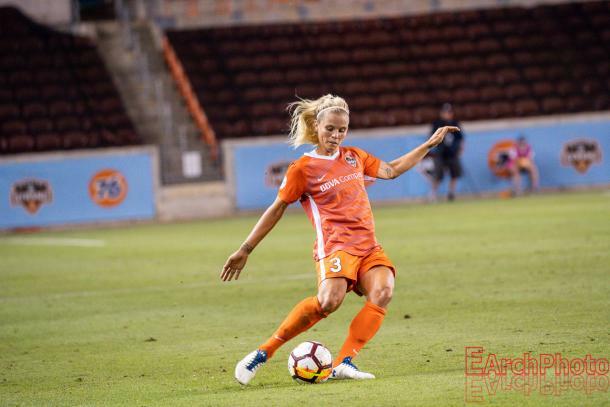 Houston Dash forward Rachel Daly has been named the May Player of the Month. 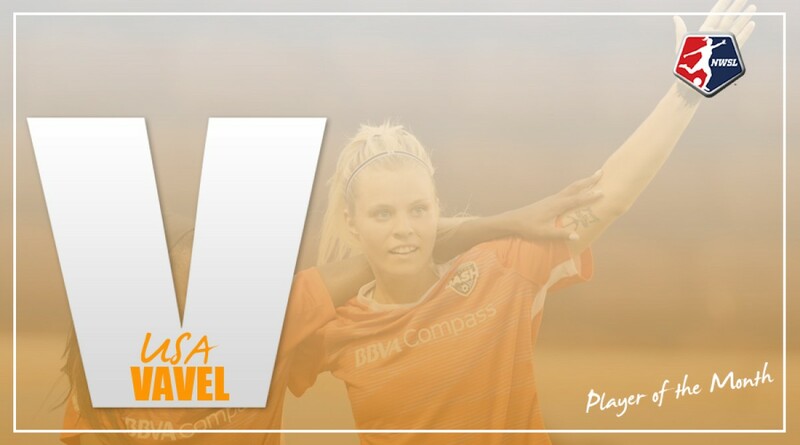 Houston Dash forward Rachel Daly has been named Player of the Month for May by the NWSL writers association. Moving back up to the forward position after being on defense at the beginning of the season, Daly has regained her scoring touch. Daly scored four goals in six games leading the Dash to a 3-1-2 record for the month and catapulting the Dash into fifth place in the NWSL table. She would create a total of 11 chances with nine shots on goal and has played every minute of Houston’s games for the month. Daly now leads the team with four goals and is one away from tying her career high of five. The first of Daly’s four goals came against Sky Blue FC on May 5. Daly chipped a shot over the reach of goalkeeper Kailen Sheridan. This was Daly’s first goal of the season and helped Houston earn their first win of the season 3-2. Daly tallied her second goal of the month came in a 2-2 draw against the Chicago Red Stars on May 12. Teammate Nichelle Prince found Daly on the breakaway and Daly fired a low curling shot around goalkeeper Alyssa Naeher to give Houston the early lead. Daly would also be involved in Houston’s second goal. On a perfectly executed set piece, Daly set a low free kick to Kyah Simon who touched it to a wide open Kristie Mewis who fired it home to give Houston the lead again. The English International did not score against the Seattle Reign FC on May 23 but her free kick in the 68th minute set up the equalizer in Houston’s come from behind victory. Daly’s service pinballed in the box then found Mewis who tapped the ball home. The 2-1 victory was Houston’s first against Seattle that snapped a 10 match losing streak. Daly capped off the month with her first NWSL brace in a 3-2 win against the Washington Spirit on May 27. Once again Prince crossed a ball to Daly who one-timed it passed goalkeeper Aubrey Bledsoe. Daly’s second goal proved to be the game winner, as Thembi Kgatlana tapped the ball passed Washington’s defense to give Daly an open net tap in. The brace would lead up to Daly being named Player of the Week for NWSL for week nine. This week the Houston Dash will host the undefeated North Carolina Courage at 7:00 PM EST on Sunday. Recently, Daly was called-up and will join the England Women’s National Team that will travel to Russia for 2019 Women’s World Cup qualifying match on June 8. The NWSL Player of the Month is selected each month of the regular season by the NWSL Media Association, a collection of writers that cover the league on a consistent basis.